Lightly maple-sweetened, grain-free, gluten-free, soft, chewy vegan thumbprint cookies. A Christmas cookie favorite made with seven real food ingredients. When I was a little girl I would get so excited to bake cookies at Christmas time with my mom and my sister. I would roll up my sleeves, put on my little apron, get covered in flour and in sugar and have the best time. 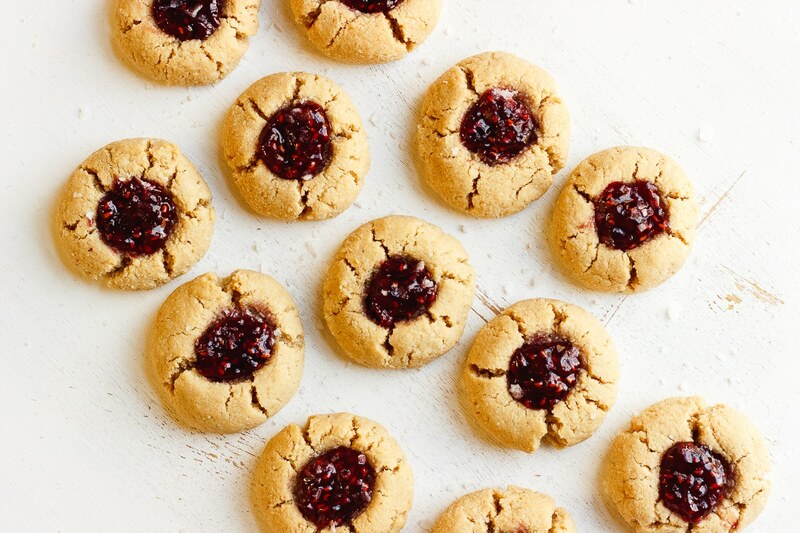 For me, these vegan thumbprint cookies with raspberry jam embody those memories. We would blast my mom’s Amy Grant A Christmas Album cassette as loud as we could. We would dance and laugh and sing around the house like no one else in the world was watching. These are truly some of my fondest childhood memories. We’d also make what seemed like hundreds of cookies. Rum balls and snowballs, and sugar cookies and gingerbread men were amongst the lineup. 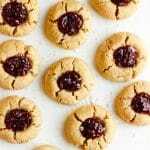 We would also make my favorite, raspberry jam thumbprint cookies. So this recipe is really near and dear to my heart. Even though I loved making Christmas cookies as a child, I really don’t enjoy baking much now as an adult. All of the measuring and preciseness really stresses me out. But I do look forward to baking a batch of these simplified, vegan thumbprint cookies with just seven ingredients. How to make the best vegan thumbprint cookies. This vegan thumbprint cookie recipe is simple and easy. It calls for just seven ingredients. The first, blanched almond flour, which makes them naturally grain and gluten-free. And six more ingredients. Baking soda, salt, vanilla, oil, maple syrup and raspberry jam. It requires twenty minutes of time, and one bowl, a sifter, a whisk, a tablespoon and a baking sheet lined with parchment paper. 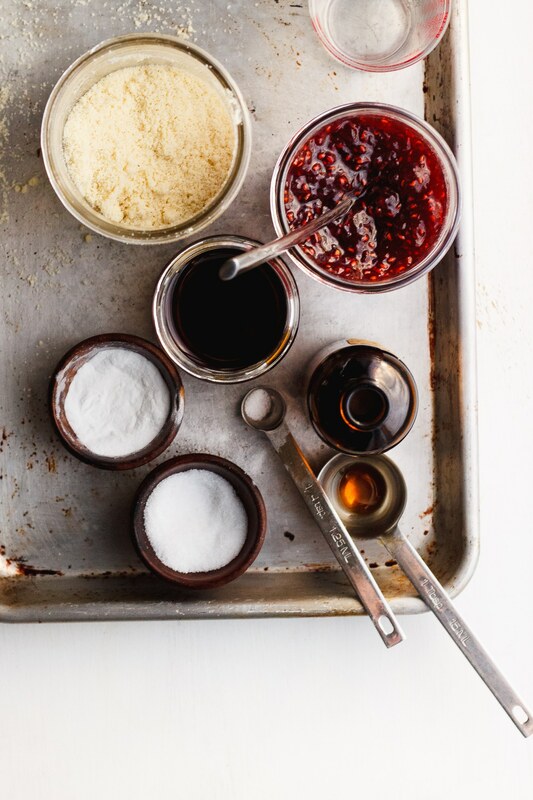 First you will sift the dry ingredients, then you will add in the liquid ingredients and then you roll them into tiny balls with jam on top and bake. Both maple syrup and honey work well in this recipe, so you can use whichever one you prefer. I prefer to use maple syrup because it is a slightly less sweet than honey. And both olive oil and coconut oil work really well in this recipe, so you can use whichever one you prefer. I prefer to use olive oil because I like the flavor better. Though whichever you choose, these chewy vegan thumbprint cookies are tried and true and a total hit every time. And they’re entirely free of refined sugar, grain, gluten, dye, dairy and egg. Sift the almond flour, baking soda and salt in a medium sized bowl. 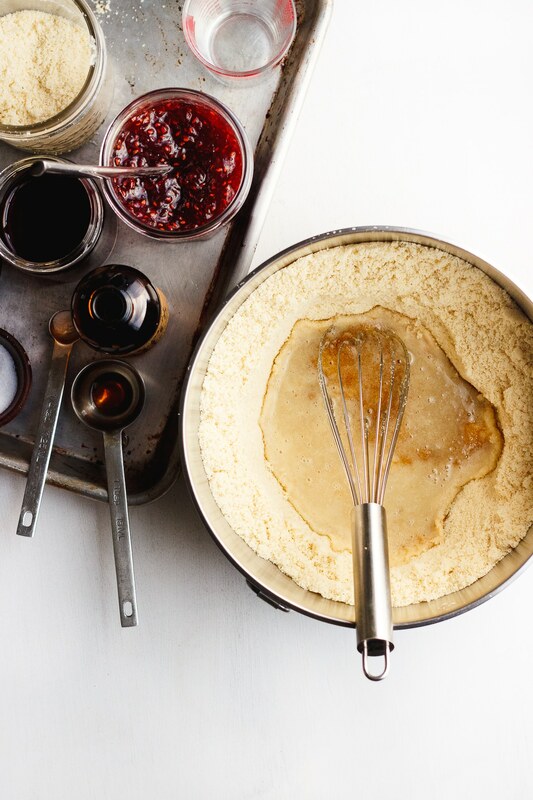 Then whisk in the oil, maple syrup and vanilla until it forms into a thick batter. Roll tablespoon sized portions into balls. If the batter is sticking on your hands, lightly grease your palms with a few drops of oil. Place the balls on the cookie sheet and with your finger press the middle to leave a small indentation in the center of the cookie. Distribute the jam into the cavities of the cookies. Bake for 13 minutes. The cookies will be soft when you remove the tray from the oven. Leave them on the tray undisturbed so they can take form as they cool. Finish with flake salt if desired. Store at room temperature for up to three days. They can also be made ahead of time and frozen. Remove them from the freezer an hour before you would like to serve them. More vegan desserts you will love. Oh my goodness. I am making these tomorrow. They look so amazing! Currently I’m battling morning sickness and NOTHING looks amazing, but these do. Well done. These cookies look so cute and delicious! The photos are gorgeous! I’ve always loved jam thumbprints, they are the best! I’m going to make a batch of these before the holidays are over. These look yummy! I am going to make some today. Me and the husband wanted something sweet last night after dinner and had nothing in the house so I searched for a simple quick (healthy) recipe and these were GREAT. Thank you! Yes! I’m so happy you loved these Mary. Can’t wait to try this one! Trying to go paleo while starting a home bakery business. Needless to say, it’s imperative that I have paleo dessert alternatives on hand at all times! Happy to provide you grain-free goodness Amanda. I just made these cookies. They are perfect. I love them and will keep baking them. Wonderful. Thank you for the recipe. Awesome – this makes me so happy Tami! I recently went grain-free and was really sad that I wouldn’t be enjoying my ‘normal’ favorite Christmas cookies. So these are back on my list to love! Thank you. OMG these are one of my most fave cookies to bake at Christmas time, so happy I came across this healthier version, they sound delicious! I wonder would it work to substitute a portion (maybe half?) of the almond flour with coconut flour? I would love to make a big batch of these but only have one small (and expensive) bag of almond flour. Hi Theresa – baking with alternative flour can be tricky, so I’m not sure if I can recommend changing the recipe in that way. If you end up doing it, please let me know how it turns out. These cookies were a great success! Perfect for those with very restrictive food diets like me. They took me less than five minutes to mix (no joke) and were quick to bake. I used Trader Joe’s juice-sweetened jam. Result was soft, savory, very little sweetened (just sweet enough for those who don’t regularly eat sugar) cookies. Will make again! Oh so happy to hear this Paola, your feedback made my day! I just printed these to make for Christmas. They look so good! I was looking for a nice Christmas treat for my brother’s vegan girlfriend and these were perfect! Even better that they’re gluten-free since my brother has celiac disease. They turned out wonderful. We sprinkled them with powdered sugar instead of almond flour for some extra sweetness! We are allergic to almonds and coconut. Could we substitute oat flour or GF all purpose flour? Would any oil work as a substitute? Hi Erin – grain-free baking is tricky, and I wouldn’t recommend that. I am wondering if these cookies freeze well? I would like to make them for a baking exchange. I need to make 12 dozen, so making them in advance and then freezing would be a time saver for me. Hi Cathy – yes they freeze great! We love these cookies! We have made them for Christmas for the past couple years. So thank you! Yes, we froze them and they were great afterwards. Thank you so much for the recipe. I have not been able to find blanched almond flour anywhere and want to check if you know whether or not using all purpose flour would be an acceptable substitute? Hi Liz – blanched almond flour is the same as fine almond flour. Bob’s Red Mill makes it! Hope this helps as ap flour would not substitute. Wow! Made these cookies yesterday and words can’t describe how good they are. They are just perfect. I’ll definitely be making them again and again – thank you! You’re welcome Leigh! I’m so glad they were a hit. Did you maybe forget an ingredient, possibly an egg? These didn’t hold together. Hi Dawn – I didn’t. The recipe is tried and true. I’m not sure what happened on your end. Did you make any substitutions? Made these last night! I found that I had to bake them a tad longer, maybe 15 minute, but it could have just been my oven. We love them. I am so happy to find a delicious vegan, refined sugar-free recipe for my favourite thumbprint cookies. Hi Robyn – I’m so glad you found these and that you loved them! I cannot wait to make these tomorrow for a Christmas Eve party! Thank you for transforming my favorite childhood cookie into grain-free goodness! Just made these with my seven year old son and his best friend. So easy to make! I love that so much, Sabine. They are so easy! I can’t wait to make these cookies! I have an unbleached almond meal in my pantry. Will that work or do I need super fine almond flour? Thank you! Hi Sylvia – using unbleached almond meal should work just fine. It might change the texture slightly, but it is usable. I used 1 1/2 cups almond meal, 1/4 cup oat flour and upped the baking soda to 1/2 teaspoon. And they were amazing! I had to lick the bowl to clean up – delicious! Can I use regular white baking flour? Hi Sandra – this recipe is developed with almond flour in mind. I wouldn’t recommend substituting in ap flour. I made these last night and they were so easy and turned out so well. I used sunflower seed flour as the store was out of almond flour, but it still worked perfectly! I can’t wait to try these again with almond flour – thanks for a great recipe! When substituting the honey for the maple syrup do I add the same amount? Hi Adrienne – honey is a little sweeter than maple syrup, but I would still use the same amount. 1/4 cup should work great. I cannot use almond flour due to a nut allergy, but would really like to make these for my aunt who cannot eat gluten or dairy. Do you have another gluten free flour suggestion that may work in this recipe? 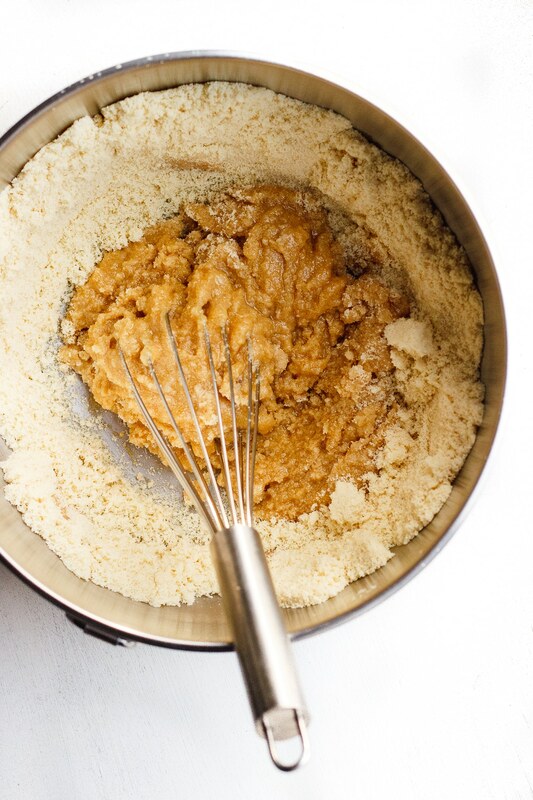 Hi Nicole – baking with alternative flours is a little complicated, so substituting the almond flour is tricky. But one reader reported back that sunflower seed flour worked in place of almond flour for them. If you try this, please let me know how it works out.